Kind, Honest, Hardworking, Responsible caregiver for your family! Want to connect with Kale? Hello my name is Kale. 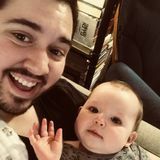 I'm a stay at home dad with my 10 month old daughter and I would like to find a family who could benefit from my caregiver skills while I can still also take care of my daughter. I’ve taken care of kids for families before, and I’ve taken care of twins! I have also taken care of kids with Autism. I am patient, kind and I truly find spending my days with kids rewarding. I am planning to start my ECE online in the winter. I have my own vehicle and license, clean record. I am more than comfortable traveling to and from activities if needed. I can take care of all kinds of pets, light housecleaning, meal preparation. All while entertaining toddlers and kids alike with educational fun ! Crafts, reading! You name it, I can do it! I can provide a background check upon request, I had my child CPR and first aid training but it has expired, I plan on having that renewed in the next 2 weeks. I can give you references upon request. Please don’t hesitate to reach out to me with any and all questions. I’m a honest, hardworking, responsible caregiver. Call, email, text. We can arrange an interview and see how things go! Hopefully you think I would be a good fit! Loving care giver in Stittsville.